Sikorsky, a Lockheed Martin company, has inaugurated a new Systems Integration Lab to begin testing key systems for the Combat Rescue Helicopter, the new aircraft being built for the U.S. Air Force. The SIL encompasses 2,500 square feet located within the company’s main manufacturing facility in Stratford, Connecticut. The SIL complex includes four laboratories for testing avionics, electrical power, electronic flight controls and integrated vehicle diagnostics. Each subsystem will be evaluated independently before progressing to a fully integrated aircraft-representative test configuration. The integrated experience will closely resemble the actual aircraft and allow the pilot to fly simulated missions to evaluate qualitative performance, such as pilot workload, and have the actual “look and feel” of the aircraft. “This facility provides a simulated flight environment allowing us to test key subsystems individually and then fully integrated. This will identify any issues before advancing to test flight, and will help reduce the number of required flight test hours, resulting in time and cost savings for the customer,” said Tim Healy, Sikorsky CRH program director. Earlier this year, the Sikorsky and USAF teams successfully executed the Training Systems Preliminary design review three months ahead of schedule. This review confirmed that the CRH program was ready to proceed with detailed design activities for the HH-60W training system, a major step in developing maintenance and aircrew training devices, courseware products and the training for the initial CRH maintenance and aircrew cadre. Sikorsky and the Air Force hosted a four-day meeting in August to provide stakeholders and key collaborators from government and industry an in-depth review that demonstrated that overall design met the training system requirements. Also participating in the review were key suppliers FlightSafety International Inc. and Logistics Services International Inc, as well as participants from the USAF acquisition and test teams, Air Combat Command, Air Education and Training Command, and representatives of the USAF operational combat rescue community. The U.S. Air Force program of record calls for 112 helicopters to replace the Air Force’s aging HH-60G Pave Hawk helicopters, which perform critical combat search and rescue and personnel recovery operations for all U.S. military services. 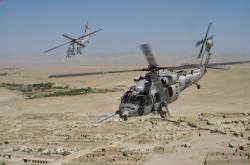 The $1.2 billion Engineering Manufacturing & Development contract includes development and integration of the next generation combat rescue helicopter and mission systems, including delivery of four HH-60W helicopters, as well as six aircrew and maintenance training devices and instructional courseware. The training devices run the spectrum from full motion simulators and full aircraft maintenance trainers, to discrete “part task training devices” for aircraft systems such as avionics, rescue hoist and landing gear. The flight simulators, including both a full flight simulator with motion and a non-motion flight training device, will be built to the highest levels of FAA standards and include the capability to link with other simulators on the Combat Air Forces Distributed Mission Operations network. The flight simulators will train full aircrew allowing pilots and special mission aviators to train together. Avionics desk top trainers will have an array of touch screens mimicking the “glass cockpit” and include the ability to learn aircraft systems troubleshooting. The CRH program conducted the Air Vehicle PDR in April 2016.